Every website owner and the internet user has the desire to know about the rank of a website.But it is difficult for a third party to analysis full traffic of a website and based on that ranking a website. Fortunately we have lot of website traffic estimation services that is producing better result.It will be helpful for competitive analysis for website owner, finding fraud for internet user, analysis research for SEO team and for designing better marketing criteria for marketing team. 1) Alexa :- This is the number one site to find the rank of a website and this is most popular also.Almost all are using alexa-com for website anylysis, it will produce almost all details about a website . see the below image checking the rank of google. 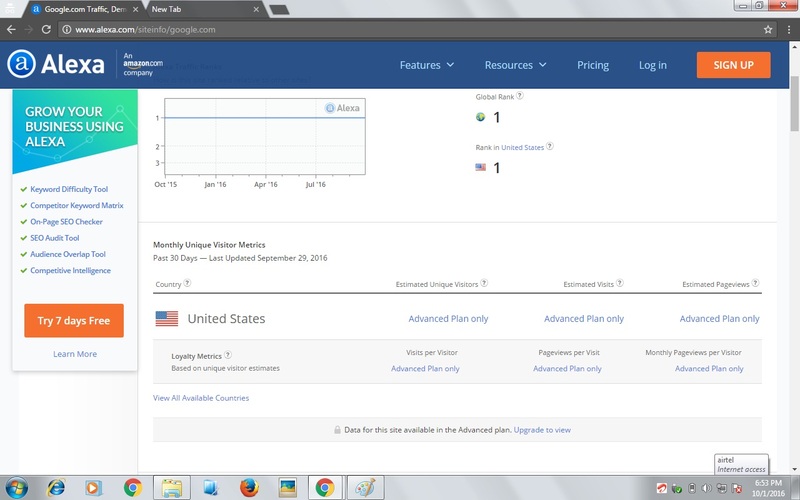 2) Similarweb :- This is another site for finding the rank of a website.it is also displaying the detailed traffic report for the list of country based on the traffic .